Yellowstone is an American drama television series created by Taylor Sheridan and John Linson that premiered on June 20, 2018 on Paramount Network. It stars Kevin Costner, Wes Bentley, Kelly Reilly, Luke Grimes, Cole Hauser and Gil Birmingham. Purchase YELLOWSTONE on Blu-ray Today! YELLOWSTONE is a series on the Paramount network that stars Kevin Costner as the patriarch of a powerful rancher family. He’s a 6th generation homesteader and loyal father who controls the largest ranch in the United States. The show focus’ on a corrupt world where politicians are bribed by big oil and lumber where land grabs are a stake worth billions. Alliances, murders and respect. There is constant conflict in a part of the Country that most would think is only serene. 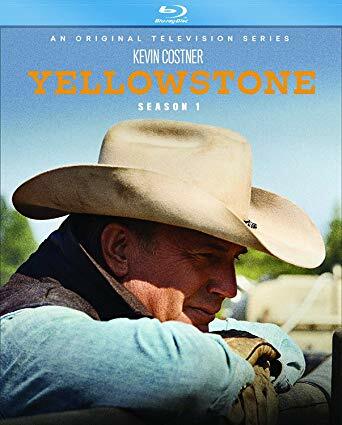 Yellowstone Season 1 is packaged in 3-disc Blu-ray and 4-disc DVD sets, list-priced $39.99 and $29.99 respectively. Also available on the Paramount Network. Yellowstone comes to blu-ray in 1080p with an original aspect ratio: 2.00:1 in a MPEG-4 AVC (24.50 Mbps) codec. As vast as YELLOWSTONE is you can imagine the visceral and vast treat one would get in cinematography in a series based on the area. There’s a great mixture of modern day tv drama’s and that of the beauty that is and surrounds the Yellowstone national park area that allows itself to capture itself beautifully in this series. The series is entirely shot on a camera much like the Red called the Arri Alexa and quite amazingly is some absolutely breathtaking shots to boot. Of course that is kind of besides the point, because the little camera has a ton of peripherals that take the price way above the common man to make it comparable to Hollywood cameras none the less. Yellowstone comes to Blu-ray Disc with a Dolby TrueHD 5.1 multi-channel format track in English. (48kHz, 16-bit) Also included is subtitles in English SDH (for the deaf or hard-of-hearing). Lots of different sounds make up the show/series Yellowstone. From music, horses, cars, ranching, dialogue, Native American culture, and the sounds of Yellowstone, Wyoming. All of which lend itself to the audio track of the show Yellowstone. The audio plays out very well for a show, and even better in that of 5.1 Dolby. The following is the special features for YELLOWSTONE Season 1 on Blu-ray including more than 80 minutes of behind-the-scenes featurettes, and an all-new exclusive interview with Kevin Costner and Taylor Sheridan. The only major knock is that there is no digital copy, but given that this is a series from the Paramount Network it’s understandable.